Within just 2 months of its launch, Mercedes Performance Drive program has received more than 1600 applications. In fact, the actual figure is 1665. The carmaker has also announced that its AMG Driving Academy, which will be launched in India on 15th April, has been sold out, where 8000 drivers will be taught how to drive a Merc on the road this year through the StarDrive program. 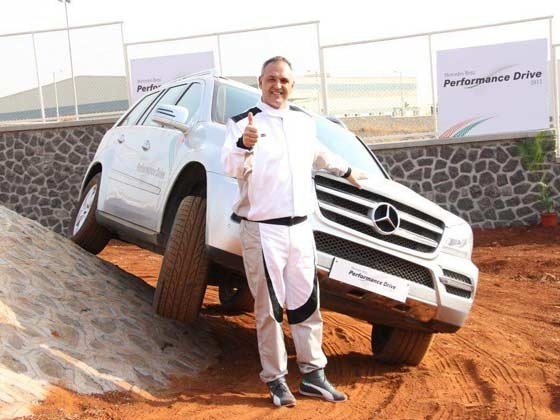 The StarDrive program will have trained professionals guiding the ‘students’ on how to drive Mercedes cars and SUVs through specially created driving situations. Mercedes officials are visibly elated at this development and they are taking it as a sign of Mercedes’s popularity in this country. Mr. Eberhard Kern, CEO and MD of Mercedes India said that this enthusiasm on part of Indian auto lovers proves that the Mercedes Performance Drive program is the most comprehensive driving training program in India and this is a clear indication that “culture of performance driving are coming of age in India”.